It’s the dry, sandy desert of the New Mexico landscape of the 1950’s. A small plane circles above in radio communication to the two state patrol officers driving in the squad car below. The pilot has alerted the officers there’s a little girl wandering the desolate area alone and agrees to follow above until they reach her. When Officer Ben Peterson calls to her, she continues to march along completely unaware of his presence, even after he tries to talk with her. The little girl in braids and a plaid robe stares blankly ahead as she numbly clutches her porcelain baby doll with a cracked head. She appears to be in shock. Further down the road, they discover a campsite in complete disarray… a station wagon with doors flung open, a trailer littered with damaged belongings, including money and a recently blood-stained cloth. Nearby, sugar cubes are scattered about, as well as an odd indentation in the sand, determined to be unlikely from any wildlife nearby. Strangest of all, the side of the trailer has been ripped open- pulled outwardly; leaving an enormous, jagged hole. The missing doll head piece and chunk of plaid cloth matching the little girl’s are also found within the wreckage. No, this curious scene is not from a mid-century version of “Breaking Bad”, it’s how we are introduced to Gordon Douglas’s THEM! (1954). 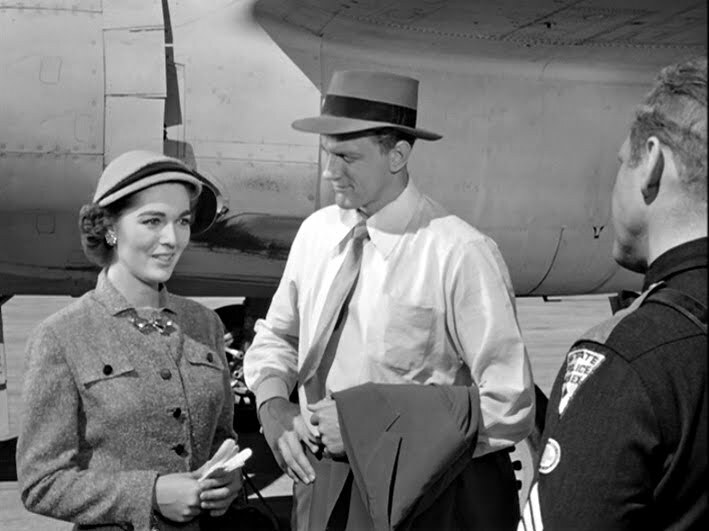 This 1950’s cult classic has remained a favorite for film fans across the decades. It was actually Warner Bros’ highest grossing movie that year. A strong cast, a compelling story, and yes, gigantic mutated ants- all this and more created a fun cinema classic. 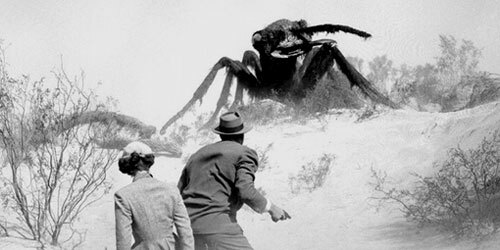 And for any folks who assume a film featuring giant insects is nothing more than B-movie drivel, note that THEM! (1954) was also nominated for an Oscar (category, Special Effects). Now back to our story. 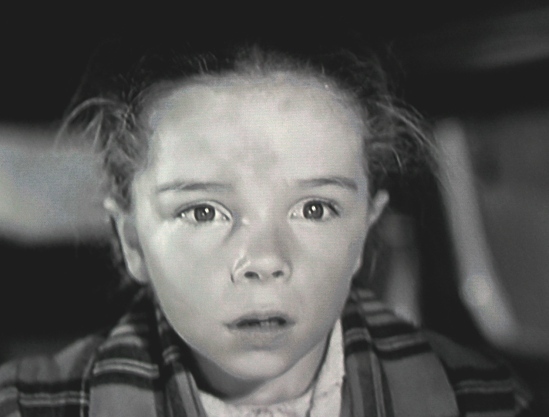 As the ambulance carefully prepares to transport the little girl, an unusual, high-pitched sound captures their attention but fades away quickly and they credit the mysterious local winds. Meanwhile, the two officers (Sgt. 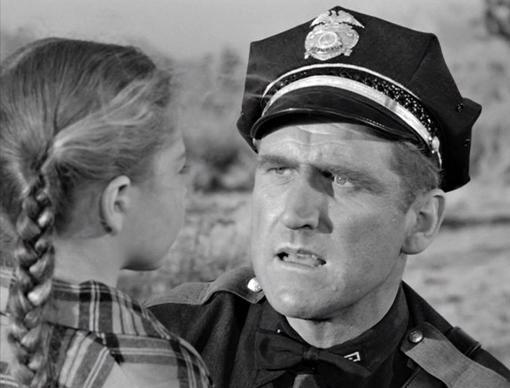 Ben Peterson is our headlining star, James Whitmore, and state trooper Ed Blackburn, is portrayed by Chris Drake) are called to Johnson’s store where they walk into another aftermath of destruction, with the similarly odd, gigantic gaping hole ripped outwardly on a side wall. This time an entire barrel of sugar has been emptied out and a twisted shotgun but otherwise no signs of robbery amongst the ransacked ruins and old man Johnson’s dead body is found; apparently brutally attacked and thrown down into the cellar. Shortly after Ben leaves to alert the team back at the station and Ed stays behind. Soon Ed hears that same high-pitched chirping sound and walks out of frame to investigate. We hear several gunfire shots and a ‘Wilhelm scream’. Back at police headquarters they review a big map that shows the trail of victims and wreckage near White Sands. Dr. Harold Medford confirms that’s the same location as the first atomic bomb explosion occurred in 1945, just nine years prior. While refusing to divulge their theory until absolutely certain, Dr.s Medford join the officers to visit the still mute-from-shock little girl. Dr. Harold Medford pours formic acid into a glass and waves it below her nose; she soon comes out of her catatonic state, blinks and screams “THEM!” and runs terrified into a corner. The doctors agree it’s time to head out into the desert to confirm their findings with the final piece of the puzzle. After agent Graham exchanges some misogynistic banter with Dr. Pat Medford, the team dons their goggles to protect against the strong sandy winds as father Medford finds more mysterious prints as before and takes measurements. He confers with his daughter his conclusion yet still keep the officers out of the loop. The mystery is finally revealed (about a third way into this film) when Dr. Pat follows more tracks of these impressions around a sand dune and the high-pitched chirping sound begins. Suddenly an enormous creature appears and comes after her. The officers respond in gunfire as the elder Dr. Medford instructs them to shoot each antennae, their means of communication. The creature has been killed and the doctors confirm their theory that all of these destructive mysteries can be attributed to ants… freakishly large ants that were mutated to this unnatural size due to the atomic blast fallout. They also reveal that this ant was merely a scout for an entire colony. They take a couple of helicopters to get a safer view and discover the entrance to the colony. We see a huge hole and one of the ant creatures pitching human bones on a pile with an officer’s gun holster (presumedly trooper Ed’s). Dr. Pat takes photos and confirms they have found their victims. Back at police headquarters, Dr. Harold Medford tries to explain to military leaders and the police team that their problem is much more complex than they realize. He demonstrates that these ants have a networked system of communication, a labyrinth of tunneling and superior method of team work that could all prove to be a colossal challenge to any typical approach. From here, our story takes on a cross-country race of man vs. beast. With ‘military might and weaponry’ combined with the scientific intellect of Dr.s Harold and Pat Medford, the battle to survive is strong on both sides. This film stands apart from many of the other typical Sci-Fi flicks of the 50’s. 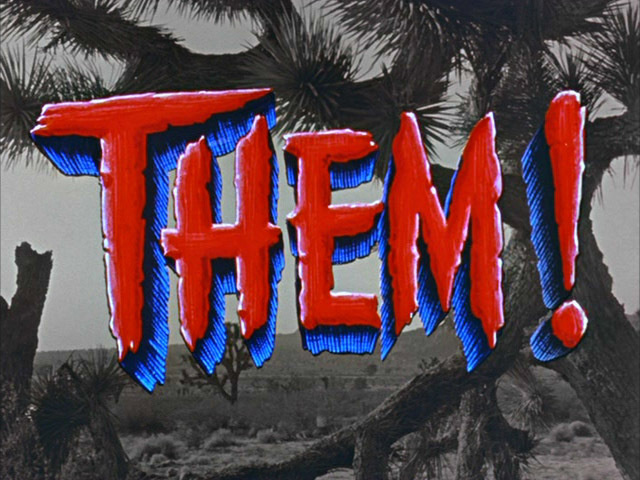 While it reflects some campy scenes as typical in these creature features such 15 foot ants crashing through walls and the humorous ‘battle of the sexes’ character development between Pat Medford and Agent Graham, this film was highly influential as one of the very first to kick-off a long string of such mega-sized monsters and over-sized bugs attacking on the big screen. But THEM! (1954) took this topic seriously. It’s packed with a solid line-up of many recognizable (most uncredited cameos, including a young Leonard Nimoy, Fess Parker and many more) character actors – with the performances and quality of this film being superior to the many B-flick versions that followed. It’s also unique in that the first 30 minutes follows a ‘who-dunnit’ murder mystery plot then switches the rest of the film to a ‘mega monster’ chase for survival. I had also heard that Ishiro Honda’s original GODZILLA “GOJIRA” (1954) from Toho Studios was influenced by THEM! (1954). Considering they were both released in 1954, not sure if that’s true-perhaps it’s the other way around. [I will have to refer this to my twitter pals/Gojira experts Miguel aka @MonsterResort and Jim aka @DraconicVerses to see if that’s actually the case.] But it’s clear that both took on the ‘giant monster’ theme with the intent of top-notch entertainment and both were one of the very first to address the sensitive and fearful subject of the atomic bomb within a major film release. 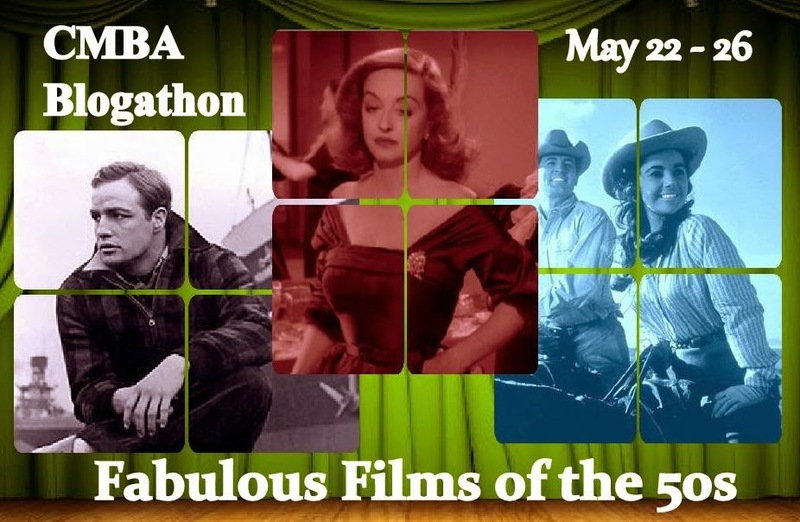 This review is my offering for the CMBA Fabulous 50’s Blogathon, of which I’m proud to be a part of. 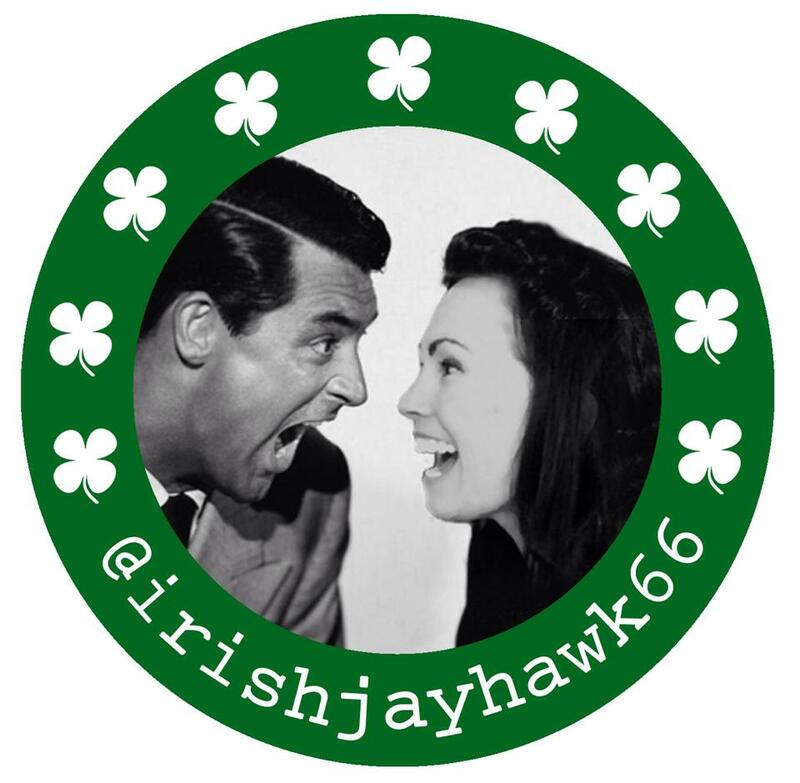 Please read all the participating bloggers’ contributions from this fine group of passionate film writers. Filed Under: Blogathon, classic film review Tagged With: B movies, creature features, giant ants, giant monsters, horror, James Whitmore, monster movies, science fiction, THEM!